Red Sox slugger Tony Conigliaro suffered a fractured cheekbone, dislocated jaw, retina damage, and blurred vision after he was struck by a fastball thrown by Mr. Hamilton in 1967. BRANSON, Mo. — Jack Hamilton, whose errant inside pitch damaged the eyesight of Boston’s Tony Conigliaro in 1967 and caused a premature end to the career of the Red Sox star, died Thursday. He was 79. Mr. Hamilton died at the Shepherd of The Hills Living Center in Branson, the Greenlawn Funeral Home said. Signed by St. Louis before the 1957 season, he was selected by Philadelphia in a minor league draft after the 1960 season. Mr. Hamilton pitched in the major leagues from 1962-69 and was 32-40 with a 4.53 ERA in 65 starts and 153 relief appearances for the Phillies (1962-63), Detroit (1964-65), the New York Mets (1966-67), the California Angels (1967-68), Cleveland (1969), and the Chicago White Sox (1969). He went 9-12 as a rookie, leading the National League in walks with 107 and wild pitches with 22. Mr. Hamilton was traded from the Mets to the Angels in June 1967 and had won eight of his first 10 decisions overall that year going into a start at Fenway Park on Aug. 18, 1967. He threw a pitch in the fourth inning that fractured Conigliaro’s left cheekbone, dislocated his jaw, and left him with retina damage and blurred vision. An All-Star who at 22 became the youngest American League player to reach 100 home runs, Conigliaro had helped put the Red Sox in position to win their first pennant since 1946. Conigliaro, whose batting stance crowded the plate, missed the rest of the season and all of 1968. Without him, the Red Sox lost the World Series to St. Louis in seven games. As Conigliaro was leaving the dugout for the on-deck circle, a fan threw a smoke bomb near Angels left fielder Rick Reichardt, causing a delay of about 10 minutes. 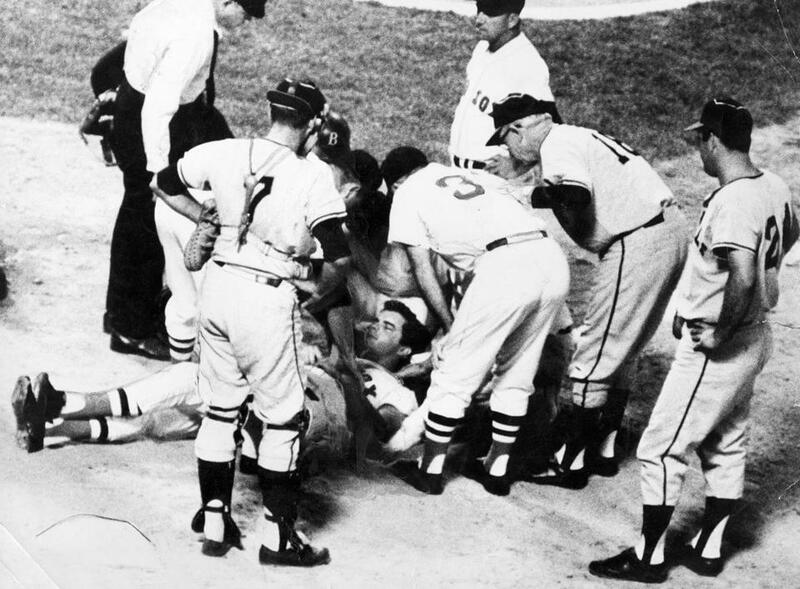 Not realizing the extent of the injury, Mr. Hamilton did not rush to assist Conigliaro. Major League Baseball did not mandate ear flaps on the side of the helmet closest to the pitcher until it was required for all new players starting in 1983. Conigliaro returned to the Red Sox for 1969 and 1970, and played for the Angels in 1971. Vision problems recurred, causing him to miss three big league seasons, and he retired at age 30 after appearing in 21 games for Boston in the first half of the 1975 season. Conigliaro fell into a coma after suffering a heart attack in 1982, and died eight years later at 45. Mr. Hamilton leaves his wife, Jan; daughter, Karla,; son Kyle; three sisters; and four grandchildren.